By Ian Aldous: On Friday June 22nd, women’s world championship boxing hits our screens live on Showtime, when unified super-middleweight world champion and double Olympic champion, Claressa Shields (5-0) takes on unified super-welterweight world champion, Hanna Gabriels (18-1-1), for the vacant IBF and WBA middleweight world championships. On the undercard, WBO and WBC middleweight world champion, Christina Hammer (22-0) defends her titles against perennial contender, Tori Nelson (17-1-3). This week, Dmitriy Salita, the Brooklyn-based promoter who’s bringing us these fights, spoke with me over the phone about June 22nd and the highly-anticipated Shields vs. Hammer showdown that is unquestionably the biggest fight that can currently be made in women’s boxing. 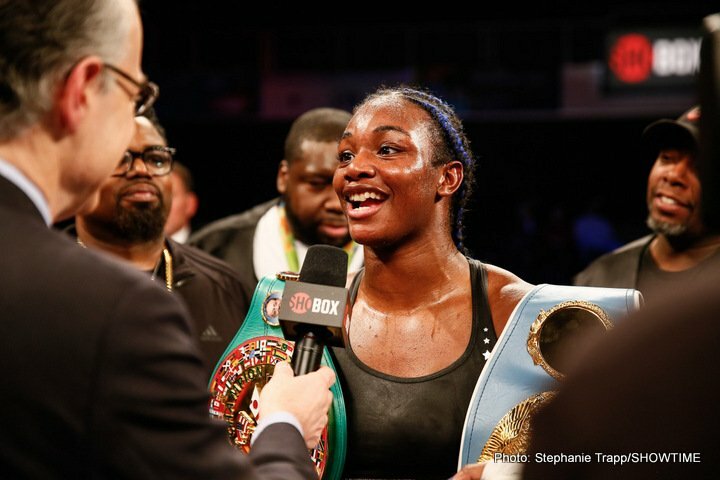 IA: Claressa Shields is taking a very bold step and chasing more world titles after winning two at 168lbs in just her fourth pro fight. What are your thoughts on the challenge that Hanna Gabriels brings on June 22nd? DS: I think Hanna Gabriels is Claressa’s toughest fight to date. Hanna is a great world champion and one of the best pound-for-pound fighters in the world. Claressa is really taking the fight game and women’s boxing to the next level by fighting such an established and good fighter in only her sixth professional fight. This is champion vs. champion. I think it’s the best women’s fight of all-time and the best women’s card of all time, as on the undercard we have Christina Hammer fighting Tori Nelson. This is a big statement for the boxing world and I think a great boost forward for women’s boxing. With Claressa, you can just see her amateur pedigree, being a two-time Olympic gold-medallist and as a professional very early in her career, she wants to fight the best fighters available to make statements in every fight. I think every one of her fights is historic and this one at the Masonic Temple is going to be a great night of boxing between two world-class athletes that are taking responsibility for the birth of the sport on a global level and I’m very honored to be the promoter for them. IA: Shields is coming down in weight, Gabriels is moving up, who do you think that favours? DS: We’ll see on June 22nd. Hanna’s a very experienced professional, a multi-time world champion. Claressa is a two-time Olympic gold-medallist and one of the hottest things in the boxing world. It’s one of these fights where an established older champion is fighting a young contender. I think Claressa’s accomplishments so early in her career, winning a world title, very soon puts her on the pound-for-pound list, but soon enough it won’t be men’s or women’s, there’s going to be one pound-for-pound list. This is a great challenge fighting Hanna Gabriels who is a very, very good fighter. This is a great fight for boxing fans. IA: I understand Shields will be working with John David Jackson from now on in her career? DS: Yes, Claressa has been in Florida training with John David Jackson. He’s very experienced and has worked with a lot of world champions. She’s enjoying the process and all the ingredients need to come together – and I feel that they’re coming together in her life. I expect a great performance from her on June 22nd. A lot of times for great fighters like Claressa, it takes great competition to bring out great performances and Hanna Gabriels is the cream of the crop. She’s a superstar in her country, (she) draws 15,000-20,000 people to her fights and fights on national television. This is a true superfight and it’s being broadcast on Showtime in the United States and I’m sure throughout different networks and platforms throughout the world. IA: You signed Christina Hammer back in December of last year. How easy was it to get her to be part of Salita Promotions, I’m guessing the fact you promote Claressa Shields had a huge impact on her decision? DS: Yes, of course. Christina is one of the best female fighters in the world. She’s a star that is multi-faceted besides being a great boxer. She does a lot of fantastic things outside of boxing. She was at New York fashion week because she’s a model and is involved with a lot of top brands, a very classy lady. She’s managed by Harald Pia, who is a very qualified guy doing a great job with her. She’s going to be fighting Tori Nelson, a multi-time world champion who went the distance with Claressa on Showtime in her last fight. We expect a great fight in that match as well. This is Christina’s first fight in the United States and she really wants to make a statement. IA: She was due to make her U.S debut on the January 12th Shields vs. Nelson undercard, why didn’t she fight? DS: Because there was really bad weather in the East Coast region of New York, her visa application got delayed for us to be able to get the proper documentation to fight. She wasn’t able to fight on that night. IA: So, if Shields and Hammer both win, is it likely we will see them battle it out for all four middleweight world titles to crown an undisputed champion? DS: Yes, that is very likely. IA: It’s the fight that you’re looking for? DS: It’s the fight that I’m looking for, but most importantly, it’s the fight that the ladies are looking for. They want to see who is the best fighter in the world at that weight class and they want to elevate the sport of women’s boxing. It takes great competitive matches to excite the fans and these fights here on June 22nd are true world championships, because you have fighters from all different parts of the world. We have Claressa from the United States fighting Hanna Gabriels from Costa Rica and Christina Hammer from Germany fighting Tori Nelson from the United States. So, this is truly an international night of boxing. IA: Just how important is it to have Showtime on board and helping you back women’s boxing? DS: Oh, it’s crucial. We were very grateful for Showtime’s support very early in Claressa’s career since her second professional fight. I think that because of Showtime’s support and being really the first network to televise women’s boxing on such a major platform has definitely improved the sport and has really raised women’s boxing around the world because of the fact that a U.S network supports it on the highest level. Their support is crucial which I am very grateful for. Tickets for Shields vs. Gabriels and Hammer vs. Nelson at the Masonic Temple in Detroit on June 22nd are available at ticketmaster.com starting from just $35. The Showtime broadcast starts at 10pm.